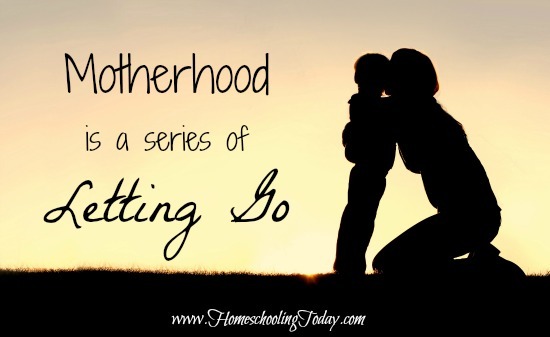 Motherhood is a series of letting goes. Mother and child—our lives together begin with a fragile strand linking one human heart to another, buried deep. But there is a knowing. God places babies between our arms and beneath our hearts, and we cradle them safely there. We feel every movement, every stretch, every hiccup; it is sweet, this mystical, symbiotic relationship. As they draw life from us, the circle comes around, and we draw life from them. But soon the space binds, the nourishment wanes, and the letting go begins. After birth, we cradle him still between our arms and beneath our hearts, but now we must share him. Sharing is good, for joy is meant to be given away; it multiplies as the love grows. Father’s arms cradle him. Grandmothers and grandfathers share the hug for the first time. As he learns to walk, he walks away and not toward, for our arms release him to explore new places and new people. But he always returns, and we cradle him sometimes only in sleep because he is busy, busy. In quiet moments we whisper prayers over him, fold his little hands to pray, and tell stories of a giant-slaying, earth-shaking, miracle-working God as we watch his eyes widen at the thought of someone larger than those he sees. 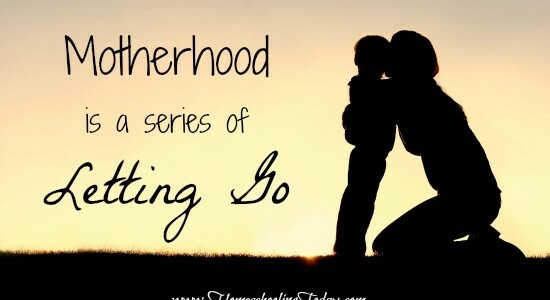 He begins to grasp and then believe in a Father even bigger, kinder, wiser, and more wonderful than his earthly father—one who holds him between His arms and beneath His heart. And we release his soul to Him, trusting that He, in the fullness of time, will draw him to Himself. For a while, everything he needs to know, we know, but he is smart and we are limited. Soon we guide him to other wise teachers, and we release him again. Then the day arrives when all that we have prayed for and pointed him toward is no longer on the horizon but is today. And we know and he knows that it is time. The future has become the present, and to hold him any longer would be to hinder him. We hold him between our arms and beneath our heart, and we whisper prayers over him to a giant-slaying, earth-shaking, miracle-working God. We remind him of his calling as an image-bearer of Christ, to let his light shine before men that they may see his good works and glorify his Father who is in heaven. And we commit him to God. Lori Hatcher is a transplanted Yankee living happily in the south with her husband, David, a youth minister, and faithful four-footed friend Winston. A seventeen-year homeschooling veteran with two young adult daughters, Lori has written the devotional book, Joy in the Journey: Encouragement for Homeschooling Moms, available on her blog. A Type-A personality who is learning to be still and sit at God’s feet, Lori writes from the overflow of her heart as God speaks to her. She loves to encourage and equip homeschooling mothers to homeschool with joy. Visit her blog, Be Not Weary, at www.lorihatcher.com. Thank you for this! I’m sharing this with my friends and will diligently continue praying for the exclamation point!